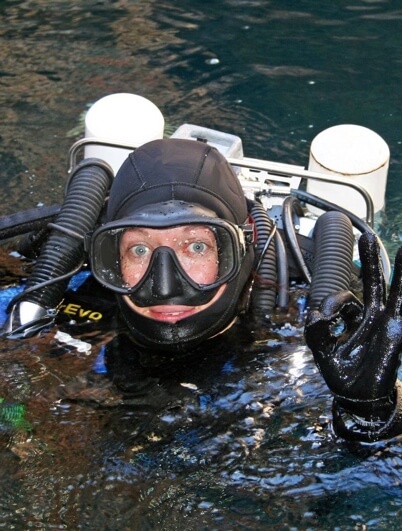 Originally training to be a teacher through a double degree in Education/Arts and then obtaining a Diploma in Frontline Management, Hannah Smeeton took a change her career path when she caught the diving bug in the 1990s. She started her professional diving career in the cold waters of the U.K. where her first foray into the business side of diving was the establishment of an independent dive club in 1999. Returning to Australia she established and ran a successful Victorian dive store that still exists today. While still developing her skills as a diver, Hannah took a professional hiatus from working in the dive industry to pursue a career in Project Management with Melbourne University. This also funded her obsession with diving around the globe, having now dived extensively in Oceania and all but one of the continents. Hannah continued to expand her knowledge of the underwater environment by pursuing numerous courses in Marine Archaeology, Marine Biology and underwater photography. Hannah returned professionally to the Victorian Diving Industry a number of years ago – simultaneously working full time with a charter company, dive shops and dive wholesalers. Hannah holds rankings as PADI IDC Staff Instructor, Gas Blender Instructor and SDI/TDI Adv Nitrox & Deco Procedures Instructor. She has earned numerous technical and CCR certifications within the CDDA, NAS, SSI, IANTD and TDI, and in 2003 she beat the Guinness World Record for the Longest Submergence on a Single 12.0lt/232 bar Tank of Air (7hrs: 25min: 8.5sec) . With over 4000 dives and 500 student certifications under her belt she has turned her attention to managing a network of dive subsidiaries dealing with importing and exporting, retail and web-based sales. Currently living on the Mornington Peninsula and residing two minutes from work and ten minutes from the hub of the Victorian diving, she continues to surround and immerse all facets of her life with diving. Holding office in a number of independent dive clubs and consulting for several dive related businesses, Hannah, in her spare time, speaks to various groups nationally on issues such as Women’s Health in Diving.